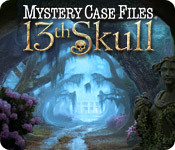 The guide I just finished for you was Mystery Case Files: 13th Skull. As per usual, Big Fish Games has another hit on hit’s hand. Keeping with previous MCF games, it was awesome! I will say that compared to MCF: Dire Grove, it wasn’t quite as good. Does that mean it’s not worth playing? Heck, no! I can’t stress enough how great a game this is and if you are a fan of MCF, then you must play this game! So what exactly did a like or not like about it? Following in the footsteps of Dire Grove, real people were used again for the characters. At first I wasn’t sure I liked that aspect, but once you get used to it, it grows on you. The graphics were spectacular, of course, but I thought they lacked a little something, but I can’t put my finger on it. There are a lot less hidden object areas than Dire Grove, for sure, and they are rather easy. I only had to use a hint a few times. The puzzles range from medium to difficult, but luckily you can skip the ones that really drive you mad. The game added something not seen previously in MCF games, and that is objectives you have to complete for the various characters. That means you have to roam around the game finding particular items and returning them to the character. While it’s an interesting addition to the game, it got a little monotonous after awhile. The ambiance was spot on, the rain, thunder, bugs, creepy sounds… really immersed me into the atmosphere of the game. The one other thing that helped the game, at least I think, was there was always an object at the bottom of the screen. This helped you not wander aimlessly wondering where you should go next, who you talk to, etc. That was very helpful and really kept the game on track and orderly. Overall, I give this game 9 out of 10. It was almost perfect! Either way, I really, really enjoyed it and stayed up many nights way past my bedtime for a school night to finish this guide – and the game! I’m not sure what I’ll be sending your way next, but keep an eye out. Until then, happy gaming!